Complete your storage area network with switches and HBAs that have been tested and validated to work with Dell/EMC products. Dell can help optimize your technology, enhance productivity, reduce risk and maximize Return on Investment (ROI) with proven expertise in infrastructure systems. 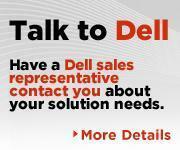 Learn how Dell's expert consultants can help.